You’ve worked hard for your keep, with discipline and perseverance. Physically, some important goals are finally being achieved. You’re probably moving towards a place where you feel more at ease, a practical stability. The fruits of your labour can now be recognized and finally enjoyed. Take some time today to quietly congratulate yourself . You’ve worked hard and deserve what you’ve received. Though the road hasn’t always been easy, developing patience and inner strength will prove well worth it. 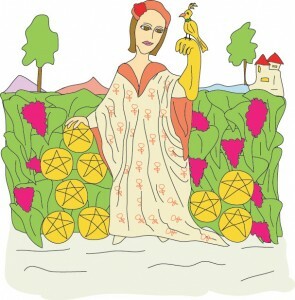 You are currently reading Tarot Card of the Day – 12/31/10 at The Tarot Room.